Have dinner guests you'd like to impress? Your house will smell divine after cooking this dish, and you just might get elevated to gourmet chef status by your dinner companions. Either frozen or fresh crab (in the shell) can be used -- King Crab or Snow Crab are both delicious, or keep it simple and make it with crab legs. This dish is so good, it is likely to stay in your recipe files forever -- and be made often! Set a wok or frying pan over medium-high heat. Drizzle in 2 tablespoons oil and swirl around, then add the shallots or onion, garlic, red chili, and galangal or ginger. Stir-fry 2 to 3 minutes, adding a splash of white wine to the pan when it becomes dry. Add chicken broth, chili sauce, ketchup (or tomato sauce), soy sauce, and fish sauce. Stir well over medium-high until combined. Set aside until crab is cooked. Cook crab using one of the methods below. Add cooked crab to the sauce. 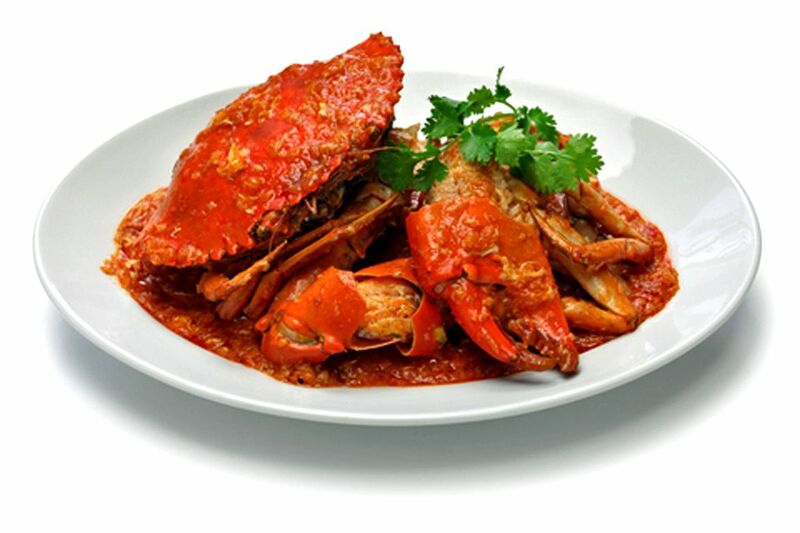 Using 2 large utensils, gently turn the crab in the sauce to coat. Break the egg into a cup and combine it with the cornstarch dissolved in water. Whisk with a fork. Add the egg mixture to the pan. Stir well to combine (sauce will thicken). Turn heat to low, continuing to stir. Taste test for salt and spice, adding more fish sauce if not salty or flavorful enough. If too salty, add a squeeze of fresh lime juice. If too spicy, add a little more tomato sauce (or tomato juice). To serve, use tongs to lift crab out of pan onto a serving platter or large serving bowl. Pour the sauce over, and sprinkle with green onion. Serve with plenty of Thai jasmine-scented rice and finger wipes (you must use your hands to eat this dish). Place 2 cups oil in wok or large frying pan over medium-high heat. Test the oil by dipping one end of a crab leg into the pan. The oil should sizzle and easily bubble around the crab (if nothing happens, the oil is still not hot enough). Make sure your crab is thawed and dry before placing it in the oil, or it may splatter. Using tongs, fry the crab until the shells turn bright red (1 minute or less). You may have to cut some of the legs to fit in the pan. Fry in batches of 4 to 5 legs. Be careful to stand back in case the oil splatters. Drain on paper towels. Provide a nutcracker if you have one, as the shells can sometimes be difficult to crack. Also, satay sticks are very useful for pushing the crab meat out of the shell. To Steam the Crab: Place crab in a steamer, or a colander set over a pot of boiling water (you may have to break it into smaller pieces). Steam for 7 to 9 minutes. Be careful not to over-steam, or the crab will lose its tenderness. To Bake the Crab: Simply wrap in tin foil and bake at 350 F for 7 to 9 minutes (avoid over-baking or crab will turn rubbery).